The early medieval period (from the early 7th to the end of the 11th centuries) is presented in the fourth and sixth rooms. 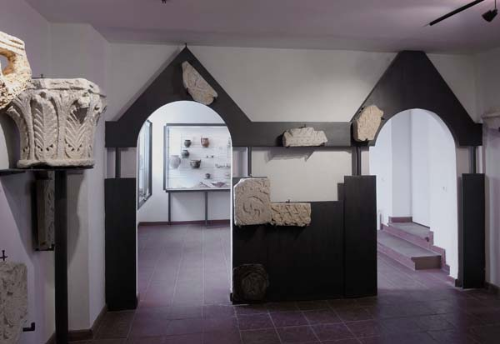 The fourth room displays early Croatian grave goods collected through many years of excavation both at cemeteries of the pagan horizon (from the early 7th to the middle of the 9th century): Materiza, ?drijac, and Banovac, and also at cemeteries with Christian features (from the mid-9th century to the end of the 11th century): by the Church of the Holy Cross and St. Anselm's. The pagan stratum is represented by finds of pottery vessels, knives, razors, awls, buckles, and so forth, while the Christian stratum is represented by jewellery finds (earrings, rings, buttons). Grave 322 from the cemetery at ?drijac is displayed in a separate case. This was the grave of the family of a Croatian dignitary (a man, woman, and child) where 38 different items were found, among which the warrior equipment stood out (a sword, a spear, spurs). The sixth room deals with the theme of ecclesiastic architecture. The room is dominated by the copy of the baptismal font from the period of Prince Vi?eslav dated to beginning of the 9th century. The font is one of the most important monuments of the early medieval Croatian state. Along with the font, numerous stone fragments are displayed of church fittings decorated with interlaced designs discovered during excavation in the churches of St. Anselm, the Holy Cross, and the Virgin Mary. A copy is also displayed of the stone beam (architrave) of the altar screen discovered during demolition of the Church of St. Michael in 1911. The name of Prince Branimir (879-892) is cited on the beam, along with the titles dominus and dux sclauorum.